Product Info: Gluten free and Wheat free. Let me just start off by saying that I do not have celiac disease, I am not gluten intolerant, nor am I allergic to wheat (at least that I know of). All of these diseases/conditions can potentially be very serious and if you have not been diagnosed with any of these conditions by a medical doctor, I generally do not recommend completely eliminating wheat from your diet. By eliminating wheat, whole wheat in particular, one is also taking out many essential nutrients such as B vitamins, vitamin E, and fiber. I will expand on wheat, celiac disease, and gluten intolerance in future posts. 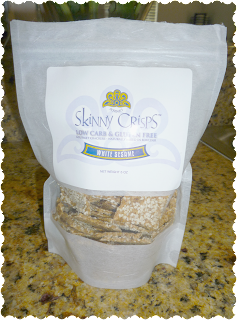 Moving on to Skinny Crisps, which are amazing by the way! They are so amazing that I couldn’t keep them for enough time after I purchased them to photograph for the review! These crackers are made with crushed almonds and chickpea flour (as a replacement to wheat flour). They are crunchy and not too crumbly, the way the crackers are supposed to be (which is particularly impressive because it is very difficult to replicate the flavor and texture of wheat flour). Now, I am not saying that they taste exactly like a wheat cracker, but they come pretty darn close! They come in several other varieties including Plain, Toasty Onion, Seeded, Say Cheese, and Brownie Crisps. For this review, I had the White Sesame variety. Note: I particularly like my crackers to be bland and plain so if you looking for something with a lot of flavor, I would maybe go for the Toasty Onion variety. As far as dietetic profile, I really cannot say anything bad about them. They are relatively low calorie, about 60 calories in 4 crisps. They are low in fat, made with the including natural oils from the seeds and nuts as well as some added olive oil. They have 2g of fiber per serving (4 crisps). They are also pretty low in sodium (which is rare for crackers). In conclusion, I will probably be buying these yummys regularly! Potential for Improvement: They are great the way they are!